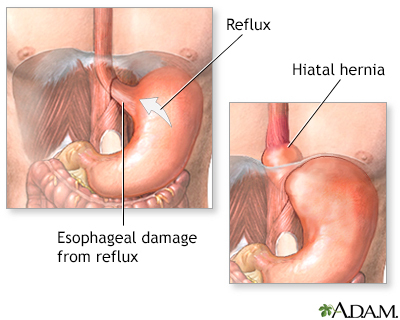 In gastroesophageal reflux disease (GERD), acid leaks out of your stomach into your food pipe. The correct answer is true. 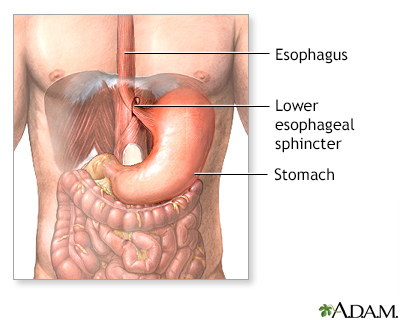 When you eat, food passes from your mouth through a tube (or food pipe) and into the stomach. 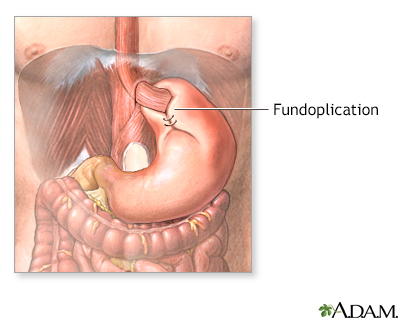 Once food is in the stomach, a ring of muscle prevents food from moving backward. If this muscle doesn't close well, food and stomach acid can leak up into the food pipe. Which is not a common symptom of GERD? The correct answer is diarrhea. GERD mainly affects the upper part of your digestive tract. 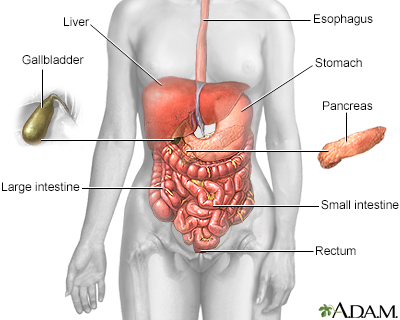 This is the part of your body that food moves through. The most common symptoms are a burning pain in the chest or the feeling that food is stuck behind the breastbone. Talk with your doctor if you think you have signs of GERD. Which medicines can make GERD worse? The correct answer is all of the above. If you suspect that one of your medicines may be causing heartburn, talk to your doctor. Never change or stop a medicine you take regularly without talking to your doctor. GERD rarely occurs in children. The correct answer is false. GERD can occur at any age. In fact, more than half of babies will have some reflux during their first three months. Contact your infant's health care provider if your baby isn't gaining weight or has trouble breathing after spitting up. If your GERD is mild, you may not need testing. The correct answer is true. Your doctor can use tests to check your esophagus (the tube that leads from your mouth to your stomach) for damage, but they may not be needed. If your symptoms are mild, your doctor may suggest diet changes and/or antacids. Antacids are the only over-the-counter (OTC) medicines that help with GERD. The correct answer is false. Several OTC medicines can relieve GERD symptoms. H2 blockers (Pepcid, Zantac) lower the amount of acid released into the stomach. Proton-pump inhibitors (Prilosec, Prevacid) reduce how much acid the stomach makes. These medicines don't work as quickly as antacids, but the benefits last longer. A. Raise the head of your bed. B. Eat a large dinner. C. Eat a bedtime snack. D. Lie down right after eating. The correct answer is raise the head of your bed. Put blocks under the head of your bed or a wedge under your mattress to raise the head 4-6 inches. It also helps to avoid large evening meals and light-night snacks. Have dinner at least 2-3 hours before bedtime. The correct answer is all of the above. These foods can trigger heartburn, but not everyone has the same reaction. Try to pinpoint and avoid the foods that cause problems for you. You can prevent heartburn by exercising right after meals. The correct answer is false. People with GERD should exercise, but not right after eating. Physical activity, particularly bending or stooping, can trigger heartburn. Find another time to exercise -- it may help you lose weight and reduce stress, both of which can lead to fewer GERD symptoms. You should call your doctor if you notice which if the following symptoms? The correct answer is all of the above. These are warning signs that GERD symptoms may be caused by something more serious. Call your doctor right away if you notice any of these symptoms. 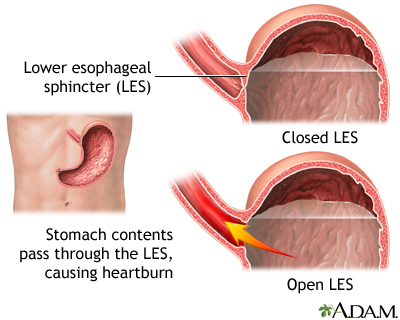 Surgery can repair the leak between the stomach and esophagus. The correct answer is true. 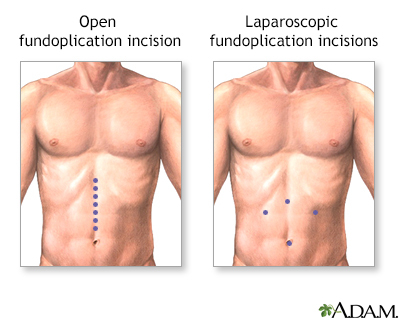 Some surgeries can tighten the connection between the stomach and the food pipe (esophagus). This helps keep food or acid from coming back up. Your doctor may suggest surgery if GERD causes serious problems, or if you want to stop taking medicine for GERD. 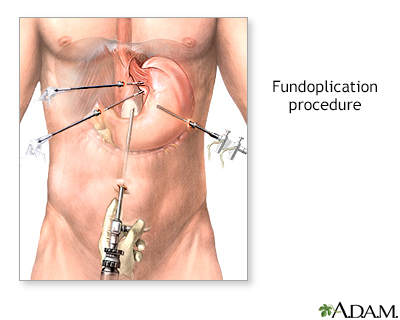 Even with surgery, you may still need GERD medicines.